Be the first to share your favorite memory, photo or story of Dora. This memorial page is dedicated for family, friends and future generations to celebrate the life of their loved one. 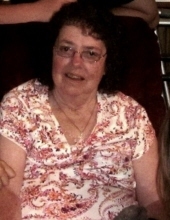 Dora Belle McClanahan, 80, of Paynesville, WV, passed away on January 27, 2019, at Buchanan General Hospital in Grundy, VA.
Dora was born December 31, 1938, in Iaeger, WV, a daughter of the late Lewis and Rosie Baker Vance. She was a loving wife, mother, grandmother, sister and a friend to everyone she met. In addition to her parents Dora was preceded in death by the love of her life, her husband of 54 years, Edward McClanahan and her in-laws, Holland (Lawerence) and Ocie Ellen Baker McClanahan. Survivors include her seven children, Donnie McClanahan of Paynesville, Judy Goodman and husband, Johnny of Bradshaw, Ronald McClanahan and wife Tressa of Paynesville, Chris McClanahan of the home, Scott McClanahan and wife Melissa of Paynesville, John McClanahan and girlfriend Lisa of Abbs Valley, VA and Timmy McClanahan and girlfriend, Nikkita of Paynesville; grandchildren, Don-Don McClanahan and wife Tracie, Derick Goodman and girlfriend Donna, Justin Goodman and wife Laura, Brittany Hurley and husband Landon, Trish Hass, Tanya Goodman, Billy Vance, Tasha Cline and husband TJ, Kaitlyn McClanahan and fiancé Matthew, Alexis McClanahan and boyfriend Dillion, Alyssa McClanahan and boyfriend Justin, Aric McClanahan, Nevaeh Longerbeam, Ciera McClanahan and friend Devon, Paris McClanahan, Brooklin McClanahan, Sophie McClanahan, Josh Reed and girlfriend Tanesha, Jacob Reed, Joseph Reed, Andrew McClanahan and fiancée Gabby, Amber McClanahan and boyfriend AJ, Abigail McClanahan and boyfriend Justin; great grandchildren Kaylee McClanahan, Hayedn Jones, Mileigh and Kason Goodman, Chloe and Blakleigh Hurley, Tyler Hass, Alic Hass, Keerstin Hass, Parker Hass, Josey Sims, William Vance, Brianna Vance, LeAnthony Vance, Noah Gregory, Karlee and McKinleigh Cline, Addalyn Nix, Jayce Reed, Jaxson McClanahan and three babies on the way; great-great grandchildren, Ryleigh and Conner Hass; eight sisters and two brothers, Seretta (Leslie) McClanahan of Paynesville, Agnes Vance and Dena Johnson of Paynesville, Dorothy Rowe of Paynesville, Lois “Polly” Vance of War, Mollie (Leonard) Davis and Debra Davis of Slate Creek, VA; Dendra “Kay” Kennedy of North Carolina, Jay (Pat) Vance of Paynesville, Kenneth and daughter Millie Vance of Paynesville and a host of nieces, nephews, family and friends. Funeral services will be conducted Thursday, January 31, 2019, at 1 o’clock with Reverend Bob Cole, Reverend Curtis Crouse and Elder Jack Cantrell officiating at the Bradshaw Mountain Community Church on Bradshaw Mountain near Paynesville, WV. Burial will follow in the McClanahan Family Cemetery on Rockridge near Paynesville, WV. Dora’s grandsons will serve as pallbearers and her brothers will serve as honorary pallbearers. Friends may visit with the family at the Bradshaw Mountain Community Church on Bradshaw Mountain Tuesday evening, January 29, 2019 after 5 p.m. and all day Wednesday, January 30, 2019; evening services will be held evening at 7 p.m.
Fanning Funeral Home in Iaeger, WV, is assisting the family. To send flowers or a remembrance gift to the family of Dora Belle McClanahan, please visit our Tribute Store. Friends may also visit at the church all day Wednesday, January 30, 2019. An evening service will be held each evening at 7 p.m.
"Email Address" would like to share the life celebration of Dora Belle McClanahan. Click on the "link" to go to share a favorite memory or leave a condolence message for the family.